A closeup of the center pattern. 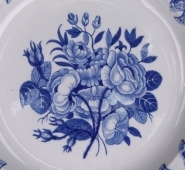 An earthenware side plate printed in blue in Spode's Vandyke pattern with a gild rim. The name derives from the beard-like shapes in the border design.